I have the privilege of traveling around the United States and Canada as I speak at Church conferences and meet with Pastors. I visit with them and hear about various programs and leadership issues. In the last year, it seems like the stories of success have been outweighed by stories of dismal projections and lack of funds. It’s a shame. On the other hand, I continue to hear about exciting Ministries that are succeeding, improving and growing. I’m often questioned, “Why do some Churches succeed and others fail”? First, I don’t have all the answers. Second, I find it hard to say that I’m an expert on this topic, however, I’m an active observer of the church and I want it to succeed. So, I set out to start examining some of the stories and started to consider why disaster is looming over some local bodies of believers. 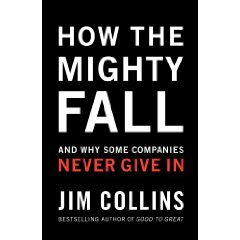 Then as a summer vacation book, I started to read, “How the Mighty Fall” by Jim Collins. Many of you have read his book, “Good to Great” and have gleaned many great (no pun intended) teachings of why companies have succeeded. Not to reiterate the entire book, but to summarize in an overly simplified fashion, “Good to Great” (G2G) examines and compares companies that have had meteoric success to see if there is a pattern. Then Jim reveals the statistics that led to patterns. And from the book, one can march their organization through similar steps and therefore become “great” too! Because I’m a branding student, I often have taken my knowledge of secular Marketing Communications and adapted it for the Church. It’s not a perfect fit, but I believe the Church organization needs to follow basic business principles or it risks failure. And “How the Mighty Fall” (HTMF) is all about failure. In an opposite approach to his G2G book, Jim examines why companies fail. And he expertly researches and compares companies that were once great and have nose-dived into failure. From watching how similar companies in the same categories rose above “external problems” (the same ones that could be blamed for the failures of others), he purports 5 steps that are similar in all the failed companies. Like G2G, I believe that HTMF has tons of information for the Church and why I think Churches suffer sometimes to failure. The good news is, as the book states, that a company (and I believe, Church) can recover from all the sequential steps except for the 5th. And even then, with the living organism called the Local Church, God can even bring it back from the 5th possibly. Ready to learn? Are you ready to change if you find yourself in one of these steps? Every Sunday for the next 5 weeks, I’ll be posting each of the steps, one at a time, and tying them to the Church. My thanks and credit to the wisdom and research of Jim Collins. (church service). What did this mean. Success by whose standard? God also values a small crowd of people of ten living real over ten thousand going to churches that may be nothing but cults or social clubs ! Totally agree (not that you were chopped liver; but the other part :-). I don’t define what ‘success’ is here. I agree with scripture; that a church’s size is no barometer of the spiritual health. I chose to be positive and fan the flames of churches who seem to be doing it correctly; where God brings seekers and spiritual leaders together. And I pray for our church leaders that they will stay true to Biblical teaching and the lost will find Christ. I’m glad you encourage that to happen!